Hoop Dance is today’s modern version of our favorite childhood activity hula hooping. While hula hooping consists of circling the hoop around one’s waist in the same direction, Hoop Dance is a full body workout where the body moves in all planes of motion. 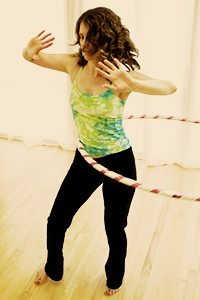 Many people who have claimed, “I can’t hula hoop” find that after learning basic Hoop Dance technique that they can indeed “hula hoop” and so much more! Susan started hooping for fun in December 2008. With her background in teaching Pilates, the transition to teaching hoop dance was very natural. Susan played an integral role in bringing hoop dance to the local community. For several years she taught multiple group classes, workshops, demonstrations, and private lessons. Susan also founded an original hoop dance troupe, “The Crazy Diamonds” and was the artistic director for the troupe for five years. Susan choreographed multiple original pieces with The Crazy Diamonds and they performed them in various places, including Dance for a Reason at The Hult Center in 2013 and 2014. Susan offers private lessons only for hoop dance and specializes in teaching students proper technique and form so that they can understand how to execute certain moves (much like Pilates). Susan is also skilled and experienced at linking hoop dance moves together to create choreography and adapting particular moves specifically for each person. Susan feels that a private hoop dance lesson is very valuable because a student can gain a lot of information in one lesson and progress quickly with such an individualized focus. All lessons are by appointment only, Monday – Thursday. Please click here to purchase your personalized, private lessons today! New client intake forms and policies can be found here.